A turtle needs a varied diet that includes plants, grasses, vegetables, fruit and fish A variety of food sources ensures the turtle's nutritional health and happiness. Commercially available turtle foods can serve as your river turtle's primary diet, but you should feed your turtle fresh sources of nutrients at least once or twice a week for optimal nutrition. Always provide fresh, clean water in your turtle's enclosure, and remove uneaten food to guard against food contamination illness. Feed your river turtle every one to four days, depending on his size. Larger turtles require more food than smaller turtles, but they require less-frequent feedings. Hatchlings require daily feedings. Measure out an amount of food that is smaller than the size of your turtle's head. Overfeeding your pet may make him ill, so keep portion sizes small. 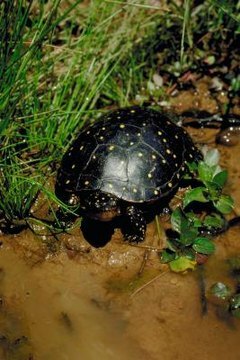 Always place your turtle's food in or near his water source, since many river turtles eat only when they are in water. Offer your turtle fish or other types of proteins at every meal. Suitable types of fish may include prawns, guppies, goldfish, minnows, mussels and any small or minced freshwater fish. Avoid feeding your turtle canned fish, as it is often salty and may contain chemicals that could be harmful to your pet. Commercially formulated freshwater fish pellets are available at most pet stores and may be substituted for fresh fish. Give various types of meats to your turtle at each regular feeding. Healthy meat choices include worms, freshwater snails, insect larvae, crickets and other small insects. Avoid fatty meats, including raw beef or mincemeat, which offer little nutritional value and may contain preservatives or chemicals that could harm your pet. Avoid commercial cat foods and dog foods, which usually contain coloring and other chemicals. Offer your turtle a variety of greens and vegetables every day. Healthy choices for your pet include carrots, squash, zucchini, kale, collard and dandelion greens, and red-leaf or Romaine lettuce leaves. Finely dice or julienne the vegetables into bite-size pieces that your turtle can easily manage. In addition to garden vegetables and greens, your turtle will enjoy tasty aquatic plants like duckweed, water lettuce, water lily, water hyacinth and anacharis. Provide small amounts of fruits to your turtle as treats. A river turtle will enjoy bits of strawberries, grapes, bananas, apples, melons or tomatoes, but remember that these fruits are high in sugar content, so limit them to less than 10 percent of your turtle's daily dietary intake to avoid constipation or nutritional deficiencies.